We were the first ones to reach the point of “Mian Mohrim Sultan” and from there started the day with stories of untold passion, courage and scenes of a nation coming together, putting aside all their differences. 1) The roadblock was an interesting one. An armored vehicle was blocking the small main road with the side ways (we will call them foot routes) all digged up. 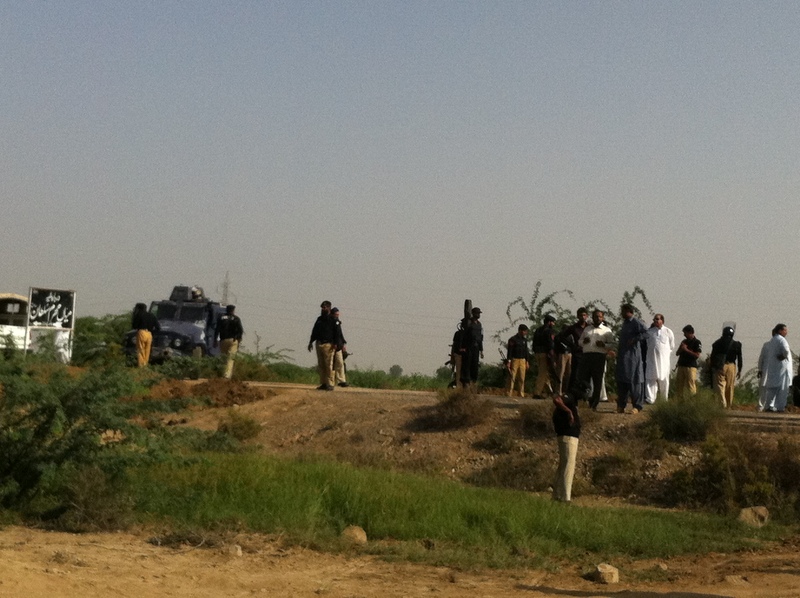 An entourage of armed security personnel was standing there, guarding the route. The picture below doesn’t do total justice as the trenches are not visible but it exposes the tall false claims of various Governments and parties in our country about not blocking the Peace March. 2) The local security establishments on duty threatened the participants with “roads paved with IED’s” all the way ahead at “Mian Mohrim Sultan”. The answer really summed it up all. Everyone said in a unanimous voice, “Yeh hamari zindagi ha aur is cause ki khatir hum ghar wasihat likh kar ayen hain” (This is our life and we’ve left our wills at home). 3) With the passions building, the local security establishment resorted to time-wasting negotiations. After almost 2.5 hours it was enough and people pushed through resulting in the inevitable, a cleared passage. 4) Prepared for “roads paved with IED’s” the foremost part of the caravan went through till we got stuck at another road-block. This time containers were used instead of an armored vehicle. The administration here again resorted to time-wasting “negotiations” alongwith warnings. Having learnt the lesson at the first obstacle, they were given a deadline of 20 minutes after which people pushed through. Passions were high, faith unshaken and patriotism at its’ peak. The containers went flying. This kept on happening till we entered Tank. Below is a picture of what happened to the containers used as roadblocks (taken from our vehicle, amongst the first ones to pass through). 5) People have been flocking all through the way but on entering Tank what we saw was unbelievable. It was as if the entire city was out on streets. Roads were filled with people clapping, chanting and thankful with tears in their eyes. Well, no words are enough to describe it so I’ll let a few pictures talk to you. Here are some pictures of sections of local crowds gathered to welcome the peace march. 6) After enjoying an unprecedented and unimaginable hospitality we were out of Tank and on our way to KotKai in South Waziristan. Our route was paved with more roadblocks. Police and FC were deputized to stop us. But the passion of the marchers was something beyond imagination. Though the security forces were extremely professional and bounded by the orders their hearts were with us, their fellow patriotic Pakistanis, for the sake of the noble cause. Below is a picture of a “stand-off” at another roadblock. I ask all the anti-march scholars, when was the last time they saw such a “stand-off”? 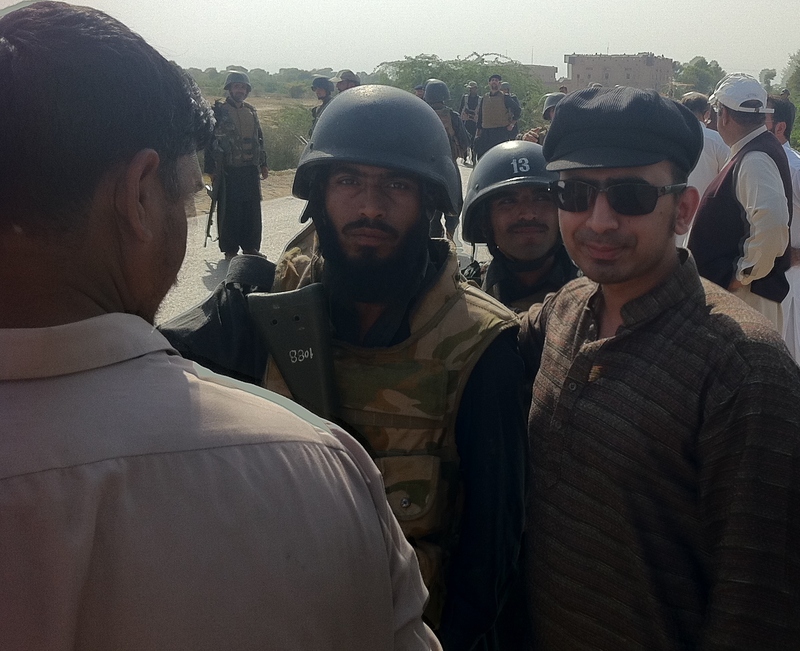 Mr. Omer Zaheer Meer (Chief Co-Ordinator, Election Cell (Punjab), PTI) alongwith security personnel. We had a standoff with local Political Agent at point just kilometers’ from Jandola. He arrived accompanied by forces under his command who had put barbed wires blocking the road. The tigers of PTI remained peaceful as per Chairman’s instructions and thus set a glorious example. The incharge of the security forces on our side of the barbed wire fence got on a side and broke news that tens’ of thousands of people had gathered in KotKai, Wana and surrounding areas and this was the reason why Governor KPK sent the political agent with strict instructions not to let the Peace March reach Jandola, “even if heavens may fall”. He said that although he supports the cause but cannot clash with the forces under the command of the political agent. Still the passion of us all meant that the forces could not resist when people said you can shoot us but we will not go and even started trying to remove the barbed wires with bare hands. Blood dripping on the fence, telling our brethren in Waziristan and all other helpless innocents that they are not alone. The result was that we overcome this obstacle too. Just than we were able to contact one of the contact persons who explained that since we’ve overstretched the time (we were suppose to be on our way back before 3 PM and even we in the furthermost part haven’t yet reached Jandola by this time) and looking at the speed of the caravan it would be dark and very late with tens of thousands of people inside a war zone. Mr. Khan took the decision a brave leader should. Having achieved the objective of highlighting the issue of illegal drone strikes and sufferings of the innocent on the Global stage, he decided not to put the lives of so many people in undue danger. 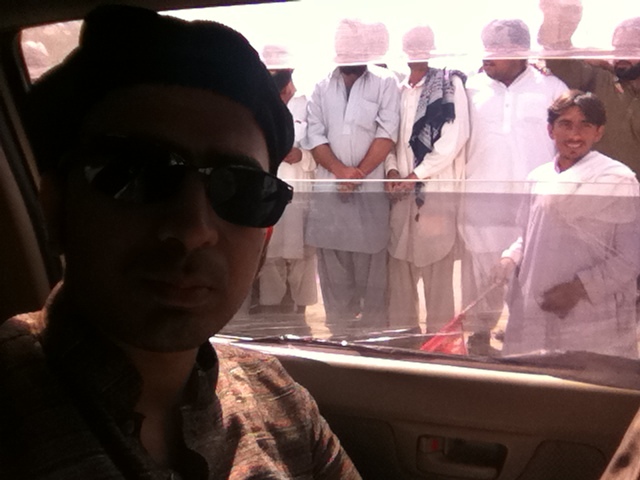 We were asked to join the Jalsa in Tank. It was yet another display of discipline, where so many people, all full of passion turned to Tank at the call of their leader having full faith in his decision. Despite all the threats and tactics, people of Pakistan broke free from the shackles of fear under the leadership of Chairman PTI, Mr. Imran Khan. The rulers and their cronies should now be afraid of the moment this passion descends upon Islamabad to break it free from the shackles of slavery. Entire nation and specially the youth are ready for the call. Although no media outlet reported it but we in the foremost part of the historic Peace March reached within kilometers of Jandola where party workers and leaders alike removed the obstacles. If you saw the enthusiasm in Tank where the entire city came out on streets, you can imagine what would have been the scenes in KotKai had the Government not used time-wasting tactis. 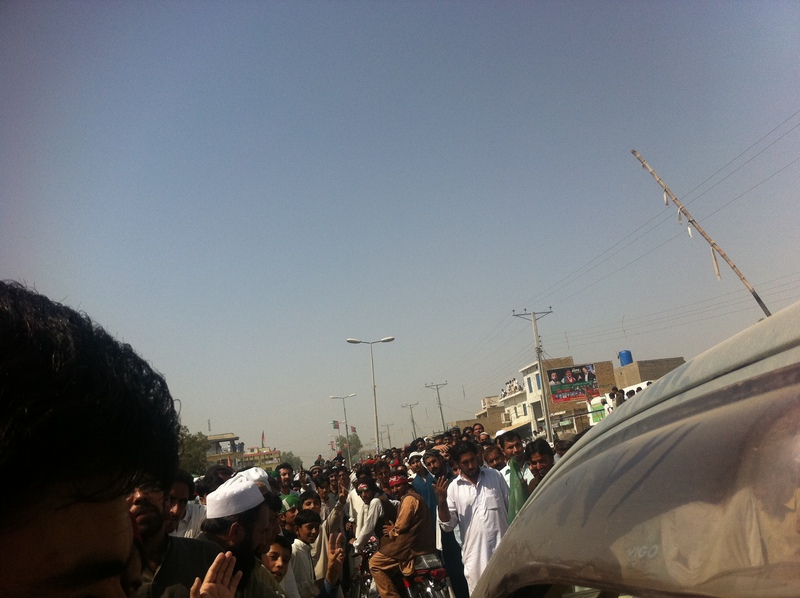 The “Jalsa” in Tank was done in a rush and thousands of people were still ahead and behind the Jalsa. The nation should be proud of what we achieved and the bravery of it’s sons and daughters. This account is owed to this Nation and the Global community, as we all deserve to know the truth. More so, in the face of the propaganda warfare by pro-status co parties and those with vested interests. 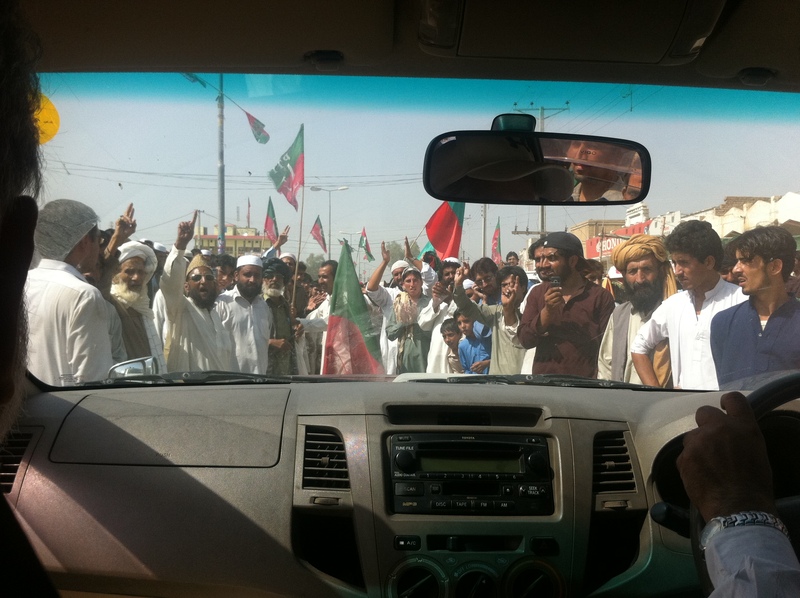 The main caravan started on 6th October 2012 from Islamabad under the leadership of Chairman PTI, Mr. Imran Khan. Several other caravans from all over and different areas of Punjab and KPK joined in along the way. The overnight stay was at D I Khan. Different caravans kept on joining in all night with constant travel in the morning to destination despite coming from long distance travel. We’ll begin with examining the claims by Government that they did not create any hurdles for the March so as to enable us to “appreciate” their marvelous “assistance”. a) As the Interior Minister Mr. Abdul Rehman Malik was utmost “concerned” about the environment of fear as well as the safety of the people he thought of a golden idea. He thought it was a good idea to make public statements about six suicide bombers in the march. This “information” was communicated to PTI’s leadership to “persuade” them to call off the March. This can give wrong ideas to those having a stake in attacking the peace march obviously didn’t cross the mind of our “innocent” Interior Minister. Of course, his “credibility” due to false past announcements did not really help this maneuver. b) Seeing that it did not succeed in deterring either Mr. Imran Khan or the thousands of Pakistanis marching bravely the number of suicide bombers was than increased to nine (9) “confirmed” bombers amongst the marchers. Unfortunately the non-grateful masses did not appreciate these “efforts” by Mr. Malik. c) Being worried for the safety of the people the “genius” that is Mr. Malik and the PPP Govt, came up with another masterpiece. It was announced and communicated that water sources were being poisoned to “welcome” the march. Now this was really something. Imagine the environment of fear and confusion. But what to do? These people, these marchers, proudly displaying Pakistani flags as well as the red over green of PTI were still marching on like nothing happen, like they don’t fear. d) Now it was the turn of the KPK Government of ANP to play their “caring” part. Their magical “whisper” in the ears of the central Government resulted in the Political Agent announcing no security for the march. Guess what, we didn’t need it from them anyway. 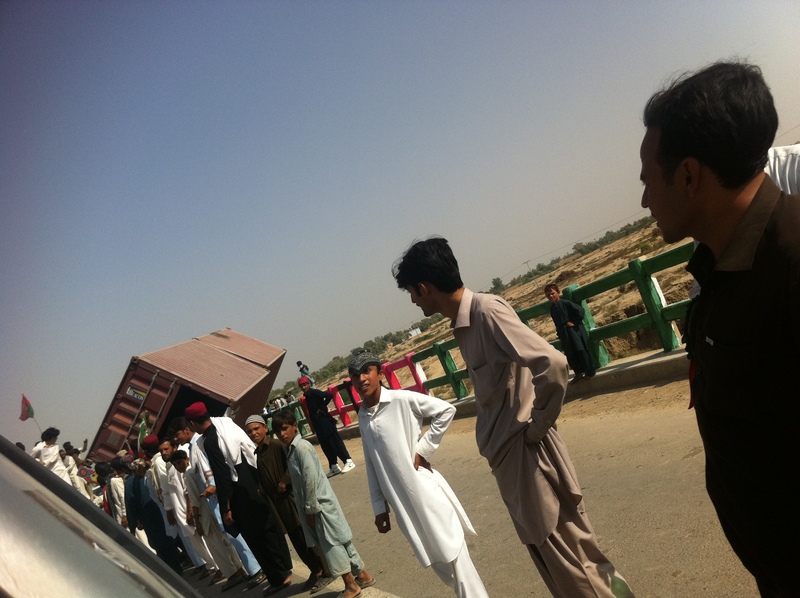 e) This being unacceptable the ANP Government, “worried” to the core (for reasons some would say were political) got the entire side-ways digged up with main roads being blocked by Armored Vehicles and Containers. Surely the marchers cannot go any further now or can they? f) How can the local political parties stay behind? They also jumped in with their own “noble” deeds. Threatening leaflets were distributed and attributed to Taliban who clarified they had nothing to do with it. More bad were the testimonies of local people incriminating one JUI-F (Yes Molana’s party) with distribution of the “leaflets”. Maybe Molana Sb just took a contract from a “new” faction of Taliban to distribute their leaflets. Anyway even this didn’t work to scare off the participants who had on their heads an aim to help the helpless. g) If Mr. Malik can be undeterred in the face of all adversity how can our “beloved” Moulana be any less. Leaflets or not this march had to be stopped but how? h) Announcement started beaming from the sound systems of Masjids organized by guess who? Ok let us leave it to your imagination. A certain political party, calling for “Jihad” against the Peace March alleging it was bringing “Jews and Christians” along with. This was without thought to the cause and the tradition of welcoming guests. “Sadly” this “noble” effort could not deter the brave people of Pakistan united under the colors of red and green from marching on for the sake of the numerous helpless victimized in the cycle of violence. i) Government than resorted to delaying tactics by putting obstacles on the route and digging up the nearby foot routes resulting in a lot of time being wasted. Since the details of the peace march from Islamabad to D I Khan are well publicized we’ll move onto the lesser known but more controversial part of the Peace March, which is the part from D I Khan onward. 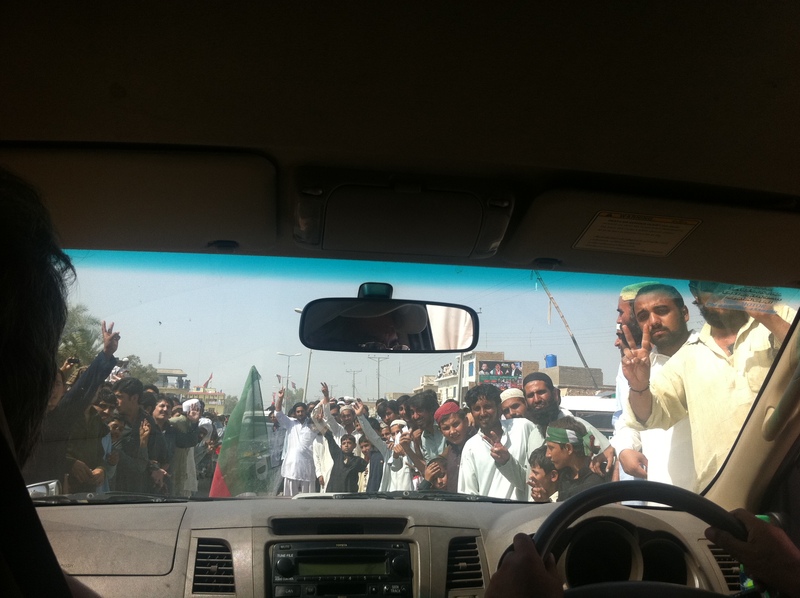 The participants were gathering at various points of D I Khan since the evening of 6th October 2012. 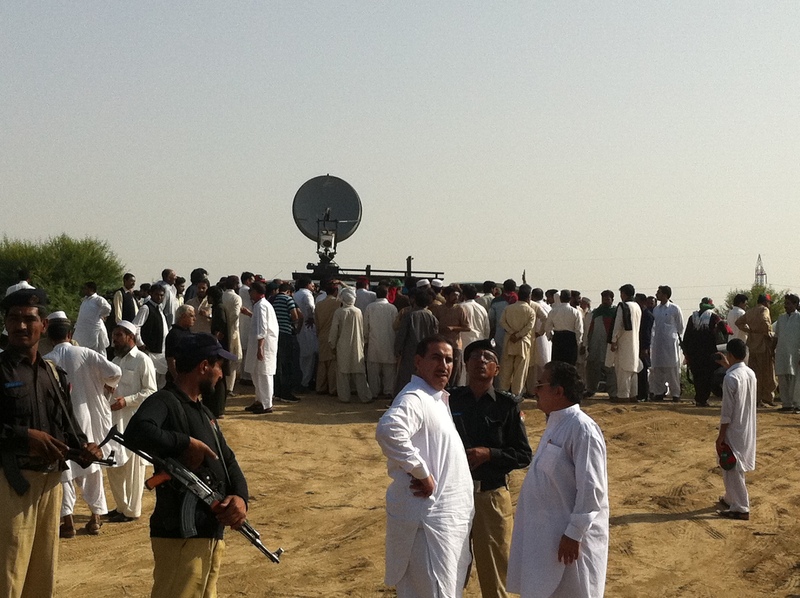 On the morning of 7th people started gathering outside the farmhouse where Mr. Imran Khan was staying. We along with a group of friends and others unknown yet bonded with us in their love for the country decided to march ahead and wait for the rest at a further point. This was to prove a good idea in hindsight. (8th Oct 2012, Lahore) – Chief Co-Ordinator of PTI’s Election Cell (Punjab) and ex-Member Executive Council, Insaf Youth Wing, Mr. Omer Zaheer Meer congratulated the nation and specially the youth for the successful Peace March. He said that despite a web of lies, misinformation and threats by Government and pro status-co parties, PTI’s supporters and the entire Pakistani nation stood brave and therefore succeeded in achieving the aim of highlighting the issue of drone attacks against innocent civilians as well as violation of Pakistan’s sovereignty, internationally. He said that the Government and its’ allies should be ashamed of their lies and tactics with Interior Minister spreading lies about nine suicide bombers and water being poisoned whereas the local security establishments on duty threatened the participants with “roads paved with IED’s” at several places including at “Mian Mohram Sultan”. The distribution of threatening leaflets and even the announcement from Masjids organized by a certain political party, calling for “Jihad” against the Peace March alleging it was bringing “Jews and Christians” along with, could not deter the brave people of Pakistan united under the colors of red and green. Government than resorted to delaying tactics by putting obstacles on the route and digging up the nearby foot routes resulting in a lot of time being wasted. Despite all these threats and tactics, people of Pakistan broke free the shackles of fear under the leadership of Chairman Imran Khan. The rulers and their cronies should now be afraid of the moment this passion descends upon Islamabad to break it free from the shackles of slavery. Entire nation and specially the youth are ready for the call. Mr. Meer further said that although no media outlet reported it but the foremost part of the historic Peace March reached within kilometers of Jandola where he was himself present and helping party workers and leaders remove the obstacles. They had a standoff with local Political Agent who arrived accompanied by forces under his command. The tigers of PTI remained peaceful as per Chairman’s instructions and thus set a glorious example. He also broke news that tens’ of thousands of people had gathered in KotKai, Wana and surrounding areas and this was the reason why Governor KPK sent the political agent with strict instructions not to let the Peace March reach Jandola, “even if heavens may fall”. He pointed out that if you saw the enthusiasm in Tank where the entire city came out on streets, you can imagine what would have been the scenes in KotKai. 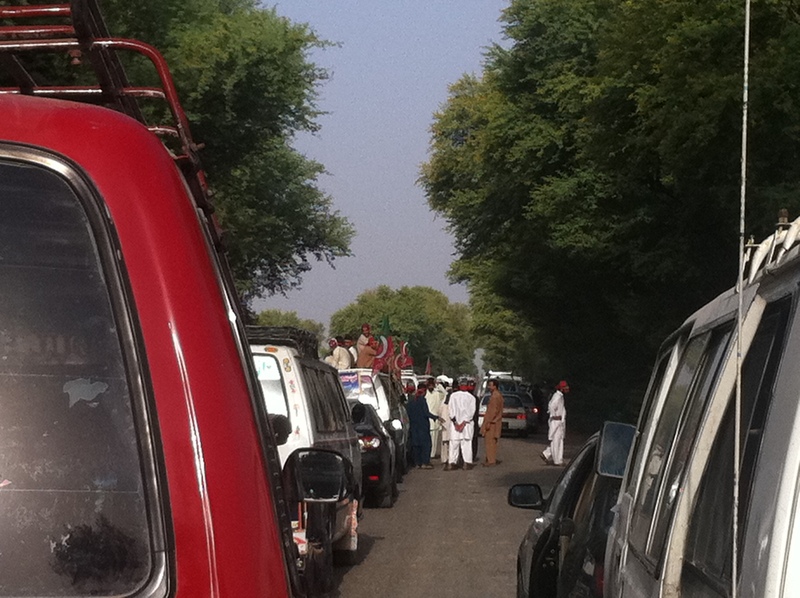 The “Jalsa” in Tank was done in a rush and thousands of people were still ahead and behind the Jalsa. The nation should be proud of what we achieved and the bravery on its’ sons and daughters. Gunmen have wounded a 14-year-old rights activist who has campaigned for girls’ education in the Swat Valley in north-west Pakistan. She came to public attention in 2009 by writing a diary for BBC Urdu about life under Taliban militants who had taken control of the valley. The chilling attack on the young peace campaigner has been leading TV news bulletins here. 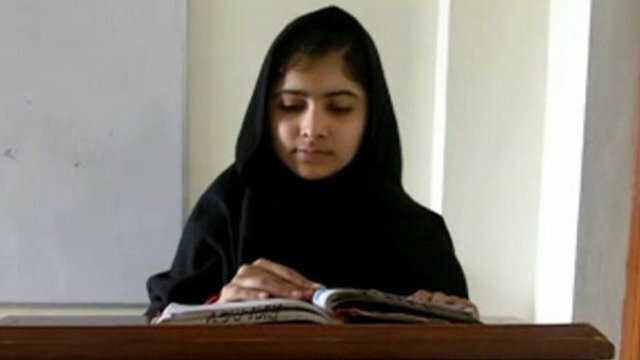 Malala Yousafzai is one of the best-known schoolgirls in the country. Young as she is, she has dared to do what many others do not – publicly criticise the Taliban. Malala’s confident, articulate campaign for girls’ education has won her admirers – and recognition – at home and abroad. She has appeared on national and international television, and spoken of her dream of a future Pakistan where education would prevail. Even by the standards of blood-soaked Pakistan, there has been shock at the shooting. It has been condemned by Pakistan’s Prime Minister, Raja Pervez Ashraf, who sent a helicopter to transfer Malala to hospital in Peshawar. The head of Pakistan’s Independent Human Rights Commission, Zohra Yusuf, said “this tragic attack on this courageous child” sends a very disturbing message to all those working for women and girls. In the diary, which she kept for the BBC’s Urdu service under a pen name, she exposed the suffering caused by the militants as they ruled. She used the pen-name Gul Makai when writing the diary. Her identity only emerged after the Taliban were driven out of Swat and she later won a national award for bravery and was also nominated for an international children’s peace award. The BBC’s Orla Guerin in Islamabad says that Malala Yousafzai was a public figure who didn’t shy away from risks and had strong support from her parents for her activism. Indeed, her father, who is a school teacher, expressed his pride in her campaigning.